Every archive has its “treasures”, items that are valuable, important or simply irreplaceable. Liverpool St Helens is no different. To my mind the treasure here is a set of correspondence from early 1900s to and from Richard Sykes and Augustus G Melly. Both of these men were pivotal in the development not just of the game of Rugby, but also in Liverpool Football Club. Augustus G Melly, a solicitor by profession, played for and Captained Liverpool; he also went on to become President of the club for many years. 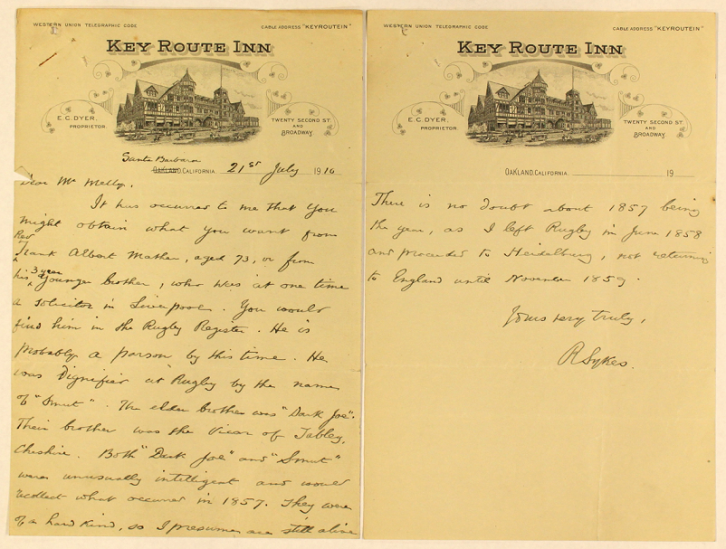 Melly decided to reach out and wrote to a number of players, including Sykes from the 1860s and 1870s asking for their recollections of the origins of that first important game and the Liverpool club. It is possible that the 50th Anniversary of the introduction of Rugby into Lancashire is what prompted the reminiscences and correspondence. The first letter dates from 14 February 1907. Richard Sykes writes to Roger Walker in Manchester with his recollections, not only of that first game in Liverpool, but also of the formation of the Manchester club, which was founded by Sykes. Regrettably, it is not known how Sykes and Melly became acquainted. The first letter in the archive between them dates from 16 July 1910; the last 7 June 1912. Sykes thanks Melly for his earlier letter and again recounts his involvement in the early development of the sport. In later correspondence Sykes names former Liverpool players who may be able to provide Melly with further information. Fortunately, some of these letters have survived and are in the archive. This small bundle of correspondence is the proof behind the claim that Liverpool St Helens is the oldest open rugby club in the world. This assertion has been contested over the years and the folder also contains a copy of a letter written by Melly and published in Arena magazine in 1912, outlining Liverpool’s claim. I have carefully repackaged these letters into acid free folders, preserving this vital evidence for the future. For me this correspondence is a good example of how archives can be used not just for research and study but as documents to support and verify any legal action, claim or dispute.